Thank you so much Mia, I looked in Ancestry.com myself but didn’t have much luck. I hope your mail gets to someone who knows! 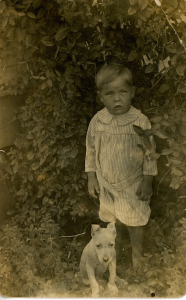 Since you have access to Ancestry — in 1920, Luther P and Martha Jeffries, living in Durant Ward 2, Bryan, Oklahoma, have three girls: Lois 8, Evlyn and Estelyn 5. The twins aren’t indexed correctly in either 1920 or 1930! But they’re in Tahoka, Lynn, Texas in 1930, Luther L & Martha J Jeffreys, with E Lois 18, Evelyn and Eshlyir 15, and Dorothy Jane 6. The mother is Martha Jane [Logan] Jeffries, died 12 Nov 1964 – Midland, Midland, Texas, hence the reference to Aunt Jane. It appears Estelyn [Jeffries] Everett died in 2000, and Evelyn [Jeffries] Haag in 2003.
oh — I got a reply. 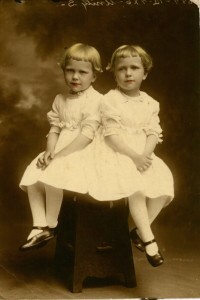 alisadunn53 on Ancestry would like a copy of the twins pics, but doesn’t know the reference to Mr. Reed. Best of luck with your puzzle! Thank you so much for your help Mia! 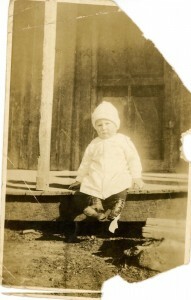 Hi Rick, Someone contacted me on Ancestry.com that you had a picture of Evelyn & Eastalyn Jefferies. They are distant cousins of mine. I would love to have that picture or a copy of it. The other two pictures you posted do they have any info on them? They were born in OK and lived in TX. Their mother had many siblings so I don’t know who would be calling her Aunt Jane. Mr. Reed isn’t familiar to me. I’m going to send out a message to others who are on Ancestry that are related to them that might have a closer relationship than I am. Do you have anything else that mentions them or the Logan family, Haag family, or the Greer family. Hello Alisa, I don’t want to split the pictures until I can try to get them to who they belong. But you’re welcome to take a copy of the picture that is posted. I saw some stuff from the Logan side of things I believe, when I get a chance I’ll look through again.